Campsis x tagliabuana 'Madame Galen' is a fast growing climber, clinging by use of aerial roots, growing up to 12 metres tall. Needing a sheltered site from cold winds, a lot of spreading room, it will happily climb a south facing wall with a little help from training wires or a trellis. 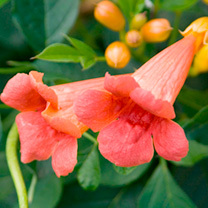 Orangey-red trumpet-shaped flowers in the summer and autumn complement the deciduous pinnate foliage, making a bushy form. Campsis 'Madame Galen' is drought tolerant once established, and can be pruned to maintain size and shape in late winter or early springtime. Supplied in a 2 litre pot.